Engineer and scholar Hugh Auchincloss Brown asks us: What immense force was able to preserve, in the Siberian tundra, living animal specimens from prehistoric times? By what process were entire tropical forests and volatile raindrops instantly arrested and fossilized? What sensible explanation can be given to the fact that each stratum of the earth’s composition seems formed by a different climate? Considerable evidence indicates that the continual growth of the ice cap at the South Pole, interacting with gravitational force, at first produces a distortion, or wobble, in the earth’s normal spin. Eventually, every six to eight thousand years, a sudden and radical shift of the earth’s axis is caused. Continents and sea areas are rearranged, and the once tropical regions may become lands of snow and ice. This classic book on cataclysmic pole shifts first appeared in 1967 and became an instant bestseller. Quickly it fell out of print, but it is now back in this deluxe edition. The book inspired the popular 1976 book The HAB Theory, about a series of global cataclysms. Brown reveals: Evidence of Careenings of the Globe; Mechanics of the Great Deluge; The Cause of Gravitation; Sir Isaac Newton on Gravitation; Physical Evidence Refuting the Universal Mutual Attraction of Masses Theory; The Growth of the Theory of Gravitation Repulsion; Dynamic Electricity; Static Electricity; Origin of the Earth’s Materials; Prehistoric Forest Floors; The Creation of the Oceans; A Cosmic Cycle in Time; and tons more. 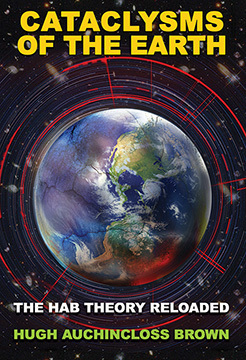 CATACLYSMS OF THE EARTH: The HAB Theory Reloaded By Hugh Auchincloss Brown. 296 pages. 5x8 Paperback. Illustrated. Index.